Newport, Tennessee born Luke Grooms, is quickly earning a name for himself as a versatile singing actor in the musical theatre and opera world. Luke’s training includes a B.A. in Music from Emory and Henry College, and a M.M. in Voice from The University of Cincinnati College-Conservatory of Music. He has been a part of some of the most prestigious opera training programs in the country, including Glimmerglass Opera, Chautauqua Opera, Des Moines Metro Opera, Sarasota Opera, and Opera North. Mr. Grooms is the recipient of an encouragement award from The Mario Lanza Scholarship Competition, as well as an encouragement from the West Tennessee Metropolitan National Council Auditions, and recieved an award from the Orpheus International Vocal Competition. 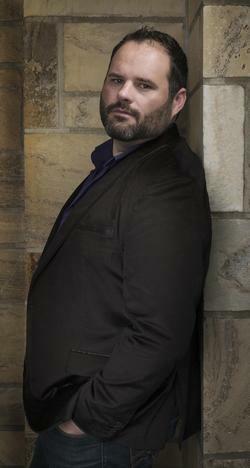 In 2006 Luke recorded his first professional recording, of Thomas Pasatieri’s opera Signor Deluso, with The Opera Company of Brooklyn on Albany Records, singing the tenor lead of Léon. Of his performance in the recording Opera News said, “…Luke J. Grooms shows sweet toned promise as the earnest lover, Léon," and was recently featured on the cd Goddesses, produced the The Shakespeare Concerts, on Parma records. Mr. Grooms began his career in the opera world, performing with many companies around the country. His greatest opera achievements include joining the Metropolitan Opera Roster for their production of Prokofiev’s The Gambler,making his Carnegie Hall debut as Fante in Opera Orchestra of New York’s concert of Verdi’s I Due Foscari, and also covering the roles of Barbagio (I Due Foscari), Elvino (La Sonnambula), and Bomelii in Rimsky-Korsakov’s The Tsar’s Bride, all with Opera Orchestra of New York. Some of his other role highlights include Tonio, Rodolfo, Belmonte, Riccardo Percy, Tebaldo, Des Griex ,Lindoro, Ramiro, Almaviva, Ernesto, Nemorino and many others. In more recent years Luke began to explore musical theatre, a passion he has held since his youth. He performed in the New York premiere of Jerry Springer: The Opera, at Carnegie Hall, singing the dual roles of Dwight and God. Luke reprised these roles in the New England premiere of the work with Boston's Speakeasy Stage Company in May of 2009, for which he was nominated for an Elliot Norton. He recently performed in a reading of a new musical, Going Hollywood, directed by Jerry Mitchell and staring Christine Ebersole and Richard Kind.